January 3 is National Chocolate Covered Cherry Day that is celebrated by millions of people across the USA. If you like chocolate covered cherry candies, then why don't you treat yourself with them on this day? No one knows the origin of National Chocolate Covered Cherry Day, but at least it is recognized by the National Confectioners Association. It means that at least American confectioners celebrate it and they indulge and enjoy the juicy and sweet flavor of candies. 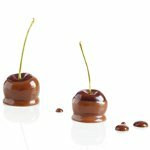 The first chocolate covered cherries were introduced by Cella's Confections in New York in 1929. Evenly Cella's was bought by Tootsie Roll in 1985 but Cella's cherries are still sold in the USA. If you don't like buying chocolate covered cherries, then you can make them at home on your own. Just take some pitted cherries and cook them in sugar syrup (with addition of some liquor if you like). Then cover cherries with confectioners sugar and with ganache made of chocolate, cream and butter. Refrigerate your chocolate covered cherries over night and enjoy the savory-sweet taste of your own candies.